Veitch's Appeal, Hearing put off. 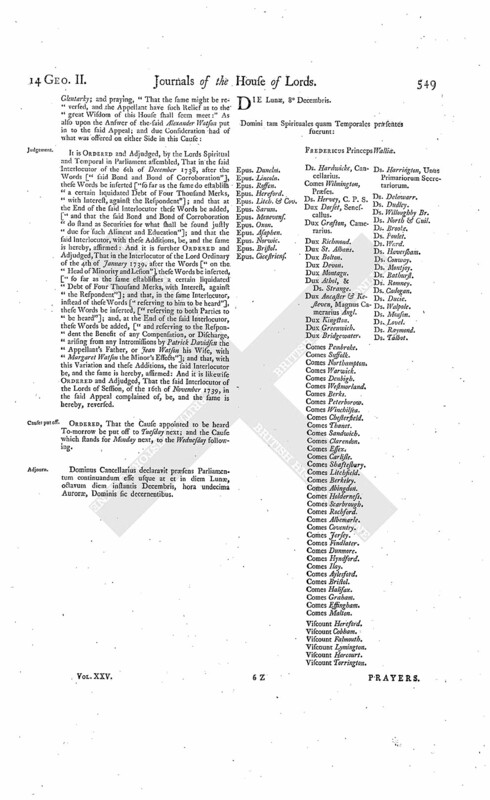 Upon reading the Petition of William Veitch, Writer to the Signet; setting forth, "That his Appeal stands to be heard on Friday next; and that the Parties thereto have lately referred to Arbitrators the Matter in Dispute between them; and praying the Hearing of the said Cause may be put off to such distant Time as the House shall seem meet:"
It is Ordered, That the said Hearing be put off to the First vacant Day for Causes after the Recess at Christmas. Mckattie against Frigg & al. 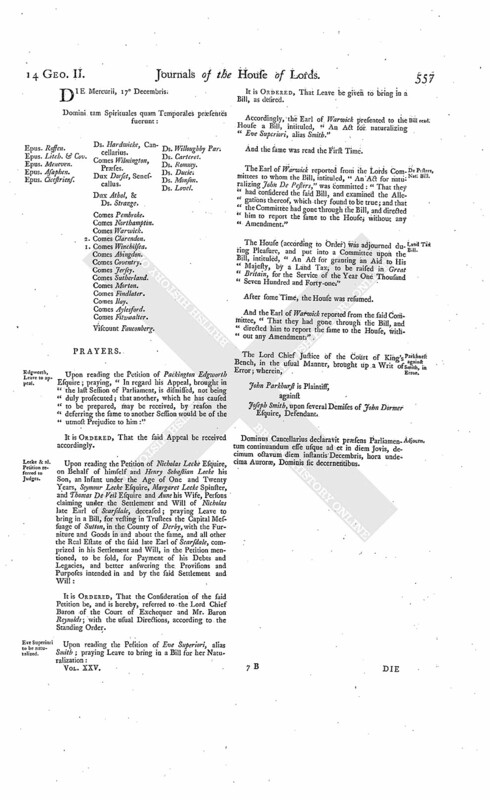 Upon reading the Petition and Appeal of Peter Mckattie of London Merchant; complaining of an Interlocutory Sentence of the Lords of Session in Scotland, of the 18th of November last, made on the Behalf of John Frigg and James Fraser; and praying, "That the same may be reversed; and that the Judgement of the High Court of Admiralty, upon an Action there brought against the Appellant by the Respondents, may be affirmed; and that this House will give the Appellant such Relief as to their Lordships shall seem meet:"
It is Ordered, That the said John Frigg and James Fraser may have a Copy of the said Appeal; and they are hereby required to put in their Answer or respective Answers thereunto, in Writing, on or before Monday the 29th Day of this Instant December; and that Service of this Order on their Counsel or Agent in the Court below be deemed good Service. Ordered, That the Thanks of this House be given to Vice Admiral Vernon, for his gallant and successful Conduct in The West Indies, and for the Services he has done his King and Country, with the small Force he commanded there; and that the Lord Chancellor do cause the same to be transmitted to the said Vice Admiral. Report Committee of Methods of applying for Papers. The Earl of Warwick reported from the Lords Committees, appointed the 24th of November last, to inquire into, and consider of, the Methods of applying for, or procuring Papers to be laid before the House, which have been used or practised, from the late glorious Revolution to this Time: "That, the Committee having directed the Clerks to search the Journals, for Instances of such Applications, they had produced divers Instances accordingly, as well by Orders of the House, as Addresses to the Crown." And the said Instances were read, by the Clerk. Moved, "To resolve, That an humble Address be presented to His Majesty, that He will be graciously pleased to give Directions to the proper Officer, to lay before this House, Copies of the several Orders and Instructions given to Vice Admiral Vernon, from the Time of his failing from England in the Year 1739, to the 24th of June last; except only such Parts of those Orders and Instructions which relate to any particular Design yet remaining to be executed." "1st, Because we conceive, that the calling for all Instructions given to Generals and Admirals is not only proper and precedented, but is also a necessary Step towards the Exertion of our Privilege, as Hereditary Counsellors, of advising the Crown; which Privilege can properly be exercised only in Matters depending: And if, from pretended Apprehensions of unseasonable Discoveries, Instructions are to be kept secret from this House till after they have had their Effect, the Weakness or Guilt of the Measures of an Administration will appear probably too late to punish the Offenders, but certainly too late to prevent the Mischief. "2dly, Because we do not find any Negative put upon Motions for Instructions before the Year 1721; from which Time indeed Instructions began to be of such a Nature, that we do not wonder their Authors desired to conceal them. The Instructions by which our Fleet lay in shameful Inaction before Gibraltar when besieged, and suffered the Enemies Ships to bring Provisions and Ammunition to their Army; and those by which Three Admirals, about Thirty Captains, above One Hundred Lieutenants, and Four Thousand Seamen, perished most ingloriously at The Bastimientos; create, as we conceive, a just Suspicion of all subsequent Instructions flowing from the same Source, and, in our Opinion, evince the Necessity of the strictest Inquiry and most ample Informations in this important Conjuncture. "3dly, Because the Motion, under the Limitations which accompanied it, was not even liable, as we apprehend, to the modern Objection, of making improper Discoveries of future Designs; and it is impossible to conceive, that when Admiral Vernon sailed from hence with so small a Force as Five Ships only, and before the long-wished-for Declaration of War, that his Instructions could contain any Thing more than Orders for Reprisals; since, considering his insufficient Force, any Orders to attempt, even what he so happily and unexpectedly executed, would have been contrary to the Genius, and inconsistent with the too long experienced pacific Disposition, of the Administration. "4thly, Because that, as The West Indies were allowed, by all Lords in the Debate, to be the proper Scene of Action, we think it our Duty more particularly to attend to the Conduct of the Administration in those Parts; especially since, from the Time of the Declaration of War, till very lately, that important Scene of Action seems to have been neglected or forgot; while, as we apprehend, the flightest Alarms have been fondly credited as Reasons for keeping our numerous Forces at Home, to the Oppression of the People; whereas a small Proportion of them, timely employed in The West Indies, against a then unprepared and unprovided Enemy, might probably have enabled Vice Admiral Vernon to have brought this just and necessary War to a speedy and happy Conclusion. "5thly, Because we apprehend that the Denial of these necessary Lights, in the First Step of the Inquiry, not only casts a Damp upon the Inquiry itself, but must also lessen the Weight of any Resolutions that may be taken in the Course of it. The Nation, that so unanimously expects and calls for an Inquiry into a Conduct which at best seems to them unaccountable, if not blameable, will be confirmed in whatever Suspicions they might entertain, when the Lights necessary to remove those Suspicions are denied. And should we come to any Vote of Approbation, such a Vote may perhaps be misconstrued to be an influenced Complaisance to the Administration, the dictated Result of a pretended Inquiry, founded only upon imperfect Facts and partial Representations. Moved likewise, "To resolve, That an humble Address be presented to His Majesty, that He will be graciously pleased to give Directions, that there be laid before this House, Copies of all Letters written by Vice Admiral Vernon, to the Commissioners for executing the Office of Lord High Admiral of Great Britain, or their Secretary, and to His Majesty's Principal Secretaries of State, from the Time of his sailing from England in the Year 1739, to the 24th of June last; and also Copies of all Letters written by the said Commissioners, or their Secretary, and the Principal Secretaries of State, to the said Vice Admiral, within the said Time." It was proposed, at the End thereof, "To add these Words; videlicet, ["so far as such Letters relate to any Supplies of Ships, Men, Stores, Ammunition, Provisions, or other Necessaries"]. The Question was put, "Whether those Words shall be added to the said Question?" Protest against an Addition to it. "Because, we conceive, those restrictive Words will prevent the House from receiving that Information which we think absolutely necessary; for if Vice Admiral Vernon, in any of his Letters, has given it as his Opinion (as it is generally believed he has) that, with a moderate Number of Land Forces, he could have made such important Conquests in America, as would have brought our Enemies before this Time to sue for Peace, this House had, as we apprehend, a Right to see such Letters; without which, we conceive, this Inquiry can only tend to detect the Negligence or Corruption of inferior Officers; and the capital Errors of the Ministers themselves may remain concealed. Address to be presented to His Majesty. Ordered, That an humble Address be presented to His Majesty, "That He will be graciously pleased to give Direction, that there be laid before this House, Copies of all Letters written by Vice Admiral Vernon, to the Commissioners for executing the Office of Lord High Admiral of Great Britain, or their Secretary, and to His Majesty's Principal Secretaries of State, from the Time of his failing from England in the Year 1739, to the 24th of June last; and also Copies of all Letters written by the said Commissioners, or their Secretary, and the Principal Secretaries of State, to the said Vice Admiral, within the said Time, so far as such Letters relate to any Supplies of Ships, Men, Stores, Ammunition, Provisions, or other Necessaries." Ordered, That the Hearing of the Cause wherein Patrick Davidson of Woodmiln Esquire is Appellant, and Alexander Watson Respondent, be put off to Wednesday next; and the other Causes removed in Course. King's Answer to Address for an Embargo on Provisions. 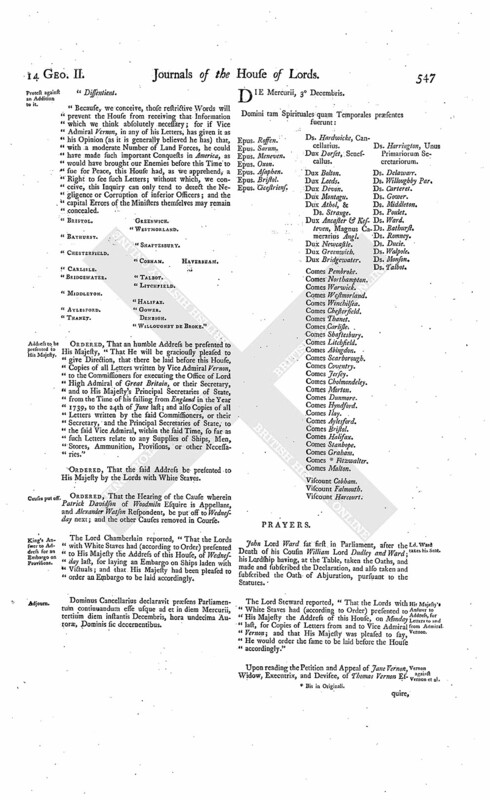 The Lord Chamberlain reported, "That the Lords with White Staves had (according to Order) presented to His Majesty the Address of this House, of Wednesday last, for laying an Embargo on Ships laden with Victuals; and that His Majesty had been pleased to order an Embargo to be laid accordingly. Dominus Cancellarius declaravit præsens Parliamentum continuandum esse usque ad et in diem Mercurii, tertium diem instantis Decembris, hora undecima Auroræ, Dominis sic decernentibus. Ld. Ward takes his Seat. John Lord Ward sat first in Parliament, after the Death of his Cousin William Lord Dudley and Ward; his Lordship having, at the Table, taken the Oaths, and made and subscribed the Declaration, and also taken and subscribed the Oath of Abjuration, pursuant to the Statutes. His Majesty's Answer to Address, for Letters to and from Admiral Vernon. The Lord Steward reported, "That the Lords with White Staves had (according to Order) presented to His Majesty the Address of this House, on Monday last, for Copies of Letters from and to Vice Admiral Vernon; and that His Majesty was pleased to say, He would order the same to be laid before the House accordingly." Vernon against Vernon et al. 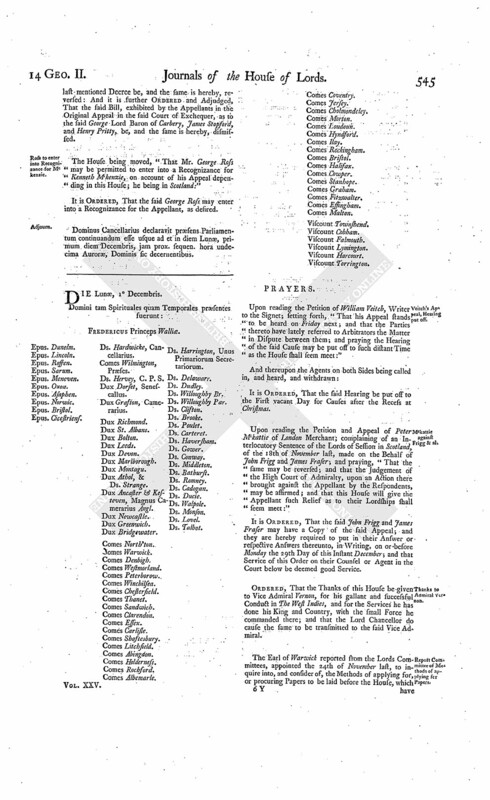 Upon reading the Petition and Appeal of Jane Vernon, Widow, Executrix, and Devisee, of Thomas Vernon Es quire, deceased; complaining of a Decree of Dismission of the Court of Chancery in Ireland, made the 14th of May 1686, in a Cause wherein John Vernon Esquire was Plaintiff, and Colonel Edward Vernon Defendant; and praying, "That the said Decree may be reversed; and that the Appellant shall hold and enjoy the mortgaged Premises, in the Appeal mentioned, against Captain John Vernon and Edward Vernon his Father, and against all Persons claiming under Mary Vernon and Colonel Edward Vernon her Father, with the Appurtenances thereto belonging, for the Remainder of a Term of One Thousand Years in the said Appeal also mentioned, or until the Appellant shall be re-paid the Sum of Two Thousand Pounds the Mortgage Money, with Interest and Costs, and the Charges she has been at, and shall be put unto, relating to the Mortgage and mortgaged Premises; or that this House will give the Appellant such other Relief as to their Lordships shall seem most meet and just; and that Edward Vernon the Father, and John Vernon his Son, Francis Huysh, Ephraim Thwaites, and Anne his Wife, Elizabeth Carter, and George Venables Vernon, may be required to answer the said Appeal:"
It is Ordered, That the several Persons last named may have a Copy of the said Appeal; and they are hereby required to put in their Answer or respective Answers thereunto, in Writing, on or before Wednesday the 7th Day of January next. Burnett against Magistrates, &c. of Aberdeen. Upon reading the Petition and Appeal of Thomas Burnett of Kirkhill; complaining of Two Interlocutors of the Lords of Session in Scotland, of the 13th and 23d of February 1738/9; and also of an Interlocutor of the Lord Ordinary, of the 27th of the same Month, made on the Behalf of the Magistrates and Town Council of Aberdeen; and praying, "That the said Interlocutors may be reversed; and that the Appellant may have such other Relief as to this House shall seem meet:"
It is Ordered, That the said Magistrates and Town Council of Aberdeen may have a Copy of the said Appeal; and they are hereby required to put in their Answer or respective Answers thereunto, in Writing, on or before Wednesday the 31st Day of this Instant December; and that Service of this Order on their Procurator or Agent before the Court of Session be deemed good Service. Dominus Cancellarius declaravit præsens Parliamentum continuandum esse usque ad et in diem Jovis, quartum diem instantis Decembris, hora undecima Auroræ, Dominis sic decernentibus. Western et Ux Petition referred to Judges. It is Ordered, That the Consideration of the said Petition be, and is hereby, referred to Mr. Justice Parker and Mr. Justice Wright; with the usual Directions, according to the Standing Order. Deane against Rose, in Error. The Lord Chief Justice of the Court of King's Bench, in the usual Manner, brought up a Writ of Error, wherein John Deane is Plaintiff, and William Rose Defendant. 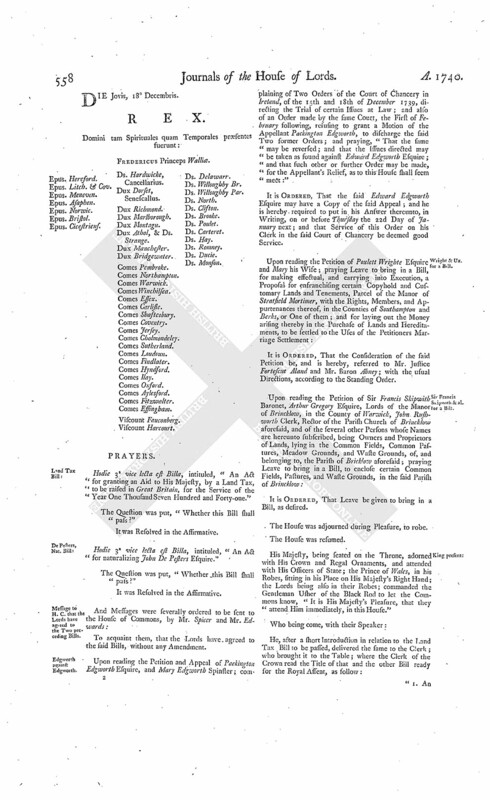 It is Ordered and Adjudged, by the Lords Spiritual and Temporal in Parliament assembled, That in the said Interlocutor of the 6th of December 1738, after the Words ["said Bond and Bond of Corroboration"], these Words be inserted ["so far as the same do establish a certain liquidated Debt of Four Thousand Merks, with Interest, against the Respondent"]; and that at the End of the said Interlocutor these Words be added, ["and that the said Bond and Bond of Corroboration do stand as Securities for what shall be found justly due for such Aliment and Education"]; and that the said Interlocutor, with these Additions, be, and the same is hereby, affirmed: And it is further Ordered and Adjudged, That in the Interlocutor of the Lord Ordinary of the 4th of January 1739, after the Words ["on the Head of Minority and Lesion"], these Words be inserted, ["so far as the same establishes a certain liquidated Debt of Four Thousand Merks, with Interest, against the Respondent"]; and that, in the same Interlocutor, instead of these Words ["reserving to him to be heard"], these Words be inserted, ["reserving to both Parties to be heard"]; and, at the End of the said Interlocutor, these Words be added, ["and reserving to the Respondent the Benefit of any Compensation, or Discharge, arising from any Intromissions by Patrick Davidson the Appellant's Father, or Jean Watson his Wife, with Margaret Watson the Minor's Effects"]; and that, with this Variation and these Additions, the said Interlocutor be, and the same is hereby, affirmed: And it is likewise Ordered and Adjudged, That the said Interlocutor of the Lords of Session, of the 16th of November 1739, in the said Appeal complained of, be, and the same is hereby, reversed. Ordered, That the Cause appointed to be heard To-morrow be put off to Tuesday next; and the Cause which stands for Monday next, to the Wednesday following. Dominus Cancellarius declaravit præsens Parliamentum continuandum esse usque at et in diem Lunæ, octavum diem instantis Decembris, hora undecima Auroræ, Dominis sic decernentibus. Viscount Hereford takes his Seat. Price Lord Viscount Hereford sat first in Parliament, after the Death of his Father Price Lord Viscount Hereford; his Lordship having, at the Table, first taken the Oaths, and made and subscribed the Declaration, and also taken and subscribed the Oath of Abjuration, pursuant to the Statutes. 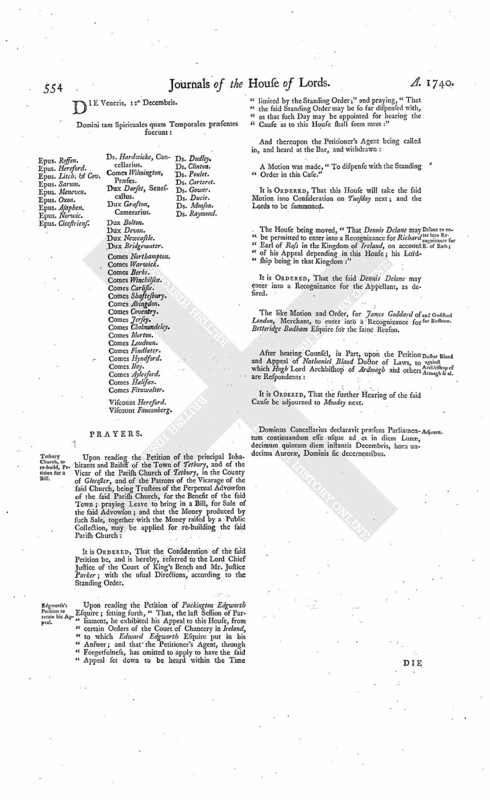 A Petition of Bettridge Badham Esquire, was presented, and read; setting forth, "That he was advised to appeal from a Decree of the Court of Exchequer in Ireland; and, for that Purpose, sent Copies of the necessary Papers to his Solicitor in London; but, by reason of contrary Winds and other Accidents, the same were not received till after the Time limited for bringing Appeals;" and praying, "That the Petitioner's Appeal may be received notwithstanding." Badham against Odell & al. 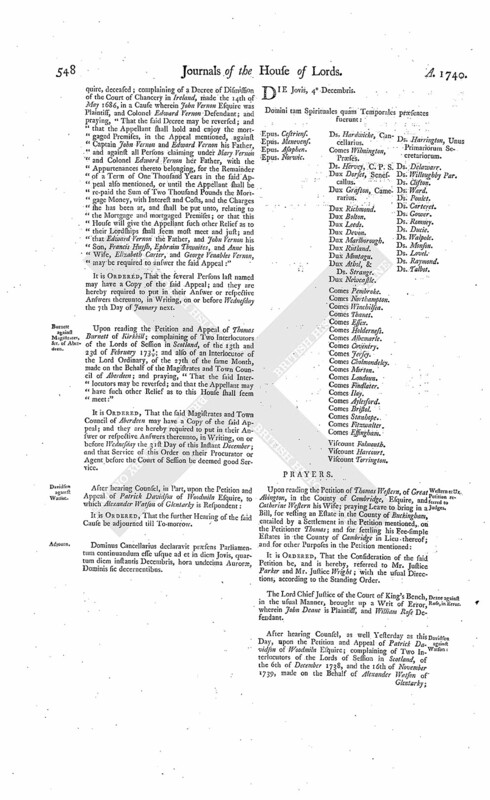 Accordingly, an Appeal of the said Bettridge Badham was presented, and read; complaining of an Order of the Court of Exchequer in Ireland, of the 20th of February 1738, made in a Cause wherein the Appellant was Plaintiff, and Thomas Odell, by James Fitz Maurice Esquire, his Guardian, Defendant; and praying, "That the same may be reversed, and all Proceedings had in Prosecution thereof." Ordered, That the said Thomas Odell and James Fitz Maurice his Guardian may have a Copy of the said Appeal; and they are hereby required to put in their Answer or respective Answers thereunto, in Writing, on or before Monday the 12th Day of January next; and that Service of this Order on the Attorney or Solicitor of the said Respondents in the said Court be deemed good Service. Proceedings of the Commissioners for building Westminster Bridge, delivered. "A State of the Proceedings of the said Commissioners, from the 21st of November 1739, to 12th of November 1740 (both inclusive)." Also, "Contracts made by the same Commissioners, during the same Time. And likewise, "Accompts of the Treasurer to the said Commissioners, from 29th September 1739, to 29th September 1740 (both inclusive)." Moved, "To order, That Copies of the several Instructions given to Rear Admiral Haddock, from the Time of his sailing from England in the Year 1738, to the 24th of June last, be laid before this House." "1st, Because we conceive that there never were Instructions more necessary to be examined than those contained in this Question, in order to enable us to discharge our Duty, both as Counsellors to His Majesty, and Guardians of the Nation. The known and astonishing Inaction, for the Space of above Two Years, of a great and powerful Fleet, fitted out and maintained at an immense Expence to the Nation, fixes a heavy Charge, either upon the Commander of that Squadron, or upon those who gave him his Instructions. But, when we compare the experienced Courage and Abilities of Rear Admiral Haddock, upon all former Occasions, with the inglorious Instructions given by this Administration to the several Admirals employed for these last Twenty Years, we cannot, as at present informed, but impute this unaccountable Inaction to the Weakness or Pusillanimity of those whose Instructions, we are persuaded, he with Concern obeyed. And we are confirmed in this Opinion, by his being still continued in that Command, which a Disobedience to his Instructions would have forfeited. "2dly, Because we think it necessary that the House should be fully informed, by what fatal Mistake, Negligence, or Design, the Spanish Squadron at Cadiz, so long blocked up in that Port, while they were neither ready nor the Season of the Year fit for them to go out, should have been, by the sudden withdrawing of our Fleet into The Mediteranean, permitted to sail without Molestation, as soon as they were fit, and the Season favourable. And we cannot, as at present informed, impute that unhappy Measure to Sir Chaloner Ogle; since Orders of that great Importance ought to be conceived in the clearest, plainest, and least ambiguous Terms; which had he mistaken, he would not have been, as he now is, intrusted with the Command of so great a Fleet, and with the Interpretation of Instructions of still greater Consequence. Nor can we conceive that the Communication of Orders, relating only to Sailing, and the Change of Station, can sufficiently clear up a Point of that great Importance. "3dly, Because we think that the stale Objection, That the Communication of these Instructions may discover to our Enemies intended Designs and Attempts, can have no Weight upon this Occasion, when the Reason for calling for those Instructions is, because no One Attempt of any Kind whatsoever has been made upon our Enemies in the Course of above Two Years. And it is not credible that if, during that Time, any One Design had been intended, no One Attempt should have been made in Consequence of it. We therefore justly may, and only can, conceive these Instructions, which we were not allowed to apply for, to be of the same inactive Nature of those which we have formerly seen flowing from the same languid Source, to the equal Dishonour of His Majesty's Councils and Arms. "4thly, Because we conceive that the Denial of these necessary Lights puts a full Stop to any further effectual Inquiry into the Conduct of the War; an Inquiry so becoming this House, and so unanimously called for by the Voice of the Nation. The outward Appearances have at once raised the Curiosity, the Astonishment, and the Concern, of a brave and a loyal People, willing to sacrifice their Lives and Fortunes for the Honour and Advantage of His Majesty and this Kingdom, in the Prosecution of this just and necessary War. And we conceive that they ought, by the strictest Inquiry, upon the fullest Informations, to have been satisfied as to the past, and secured as to the future. And we think that all minute Inquiries into the little Abuses of inferior Officers, over whom it is the Duty of the Administration to watch, would be only amusing and deceiving Mankind with the Name of an Inquiry, and descending from our Dignity of Counsellors of the Crown and Checks of the Administration, to the low Rank of Inquisitors into the Conduct of petty and unprotected Offenders. We, therefore, think that we have discharged our Duty to His Majesty and the Public, in having moved for those Papers, which we have considered as the Foundations absolutely necessary for a proper and effectual Inquiry. We here enter our Dissent upon the Denial of those Papers. The World must then judge of the Conduct of the War, upon the Appearance of Facts and Circumstances; with this considerable additional Circumstance, that Lights were denied. Address for Admiral Haddock's Orders. Ordered, That an humble Address be presented to His Majesty, "That He will be graciously pleased to give Direction to the proper Officers, that there be laid before this House, Copies of the several Orders given to Rear Admiral Haddock, from the Time of his sailing from England in the Year 1738, to the 24th Day of June last, so far as the same relate to the sailing of, or the Stations to be taken by, the Squadron under his Command, or any Ships belonging thereto, or to the Change of any such Stations." State of the Army to be considered. Ordered, That the State of the Army be taken into Consideration To-morrow; and the Lords to be summoned. Ordered, That the Hearing of the Cause which stands appointed for To-morrow be put off to the next Day; and the Cause on that Day to Friday next. Dominus Cancellarius declaravit præsens Parliamentum continuandum esse usque ad et in diem Martis, nonum diem instantis Decembris, hora undecima Auroræ, Dominis sic decernentibus. King's Answer to Address for Admiral Haddock's Orders. The Lord Chamberlain reported, "That the Lords with White Staves had (according to Order) presented to His Majesty, the Address of this House of Yesterday, for Copies of sailing Orders given to Rear Admiral Haddock; and that His Majesty was pleased to say, He would give Directions for laying the same before this House accordingly." Lists of Halfpay Officers, &c. delivered. "A List of the Regimental and Warrant Officers who were on the Establishment of Half-pay on the 24th of October 1739." Also, "A List of such Half-pay Officers who have been provided for in His Majesty's Service since the 25th of October 1739." And also, "A List of such Officers who have obtained Commissions since the 25th of October 1739, and were not upon Half-pay." And likewise, "A Copy of the Right Honourable Sir William Yonge's Commission as Secretary at War." It was proposed, "To resolve, That augmenting the Army by raising Regiments, as it is the most unnecessary and most expensive Method of Augmentation, is also the most dangerous to the Liberties of Britain." 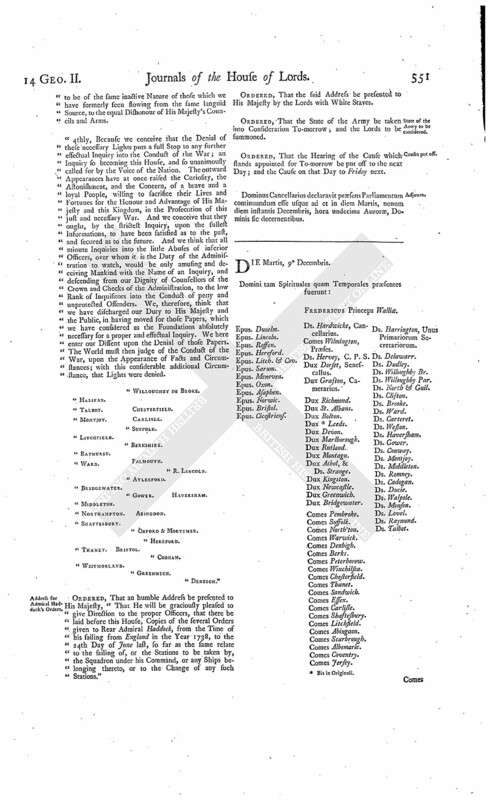 "1st, Because we conceive that this Motion ought not to have been laid aside by the previous Question; the Arguments urged in the Debate against our coming to this Resolution at this Time being, in our Opinion, highly insufficient; since we cannot apprehend what further Lights could be had, with relation to the several Propositions contained in the Question, than those we received in the Debate, authorized by the Usage of almost all the Nations in Europe; nor were there any particular Papers pointed out, as necessary for the Information of the House. And we thought this the properest Time to come to this Resolution, before any Steps were taken as to the Method of making the intended Augmentation. "2dly, Because it was proved in the Debate, and universally admitted, that the Augmentation of our Land Forces by the raising of new Corps was by near One Third a more expensive Manner of augmenting, than by additional Men to Companies: A Consideration which, in our Opinion, ought to have the greatest Weight at this Time, when the Nation is engaged in a new War, and still groaning under all the Burthens of the last, though after Thirty Years Peace. 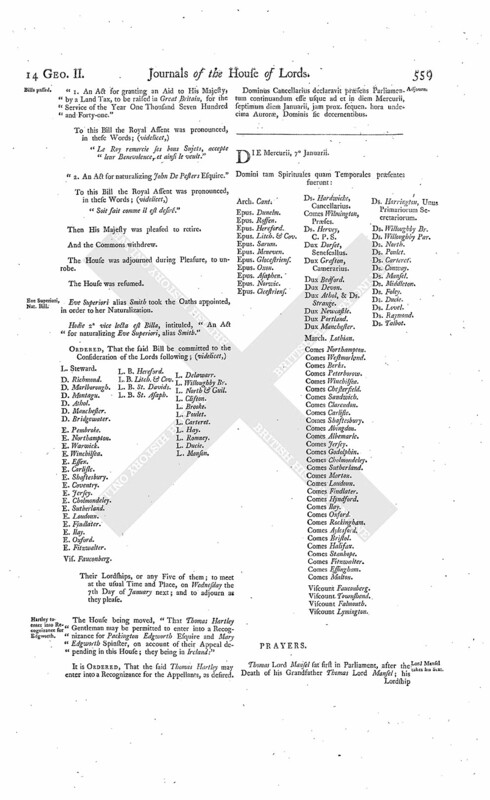 "3dly, Because, considering that the Œconomy of augmenting the Forces by additional Men to Companies was admitted, and the Utility of it not disproved, we cannot help suspecting, that the raising of new Corps at this Time, when the Election of a new Parliament draws so near, may be of a dangerous Tendency to the Constitution of this Kingdom, and relate more to Civil than Military Service: Especially, since there are now no Officers to be found (the Officers now remaining upon Half-pay having been already judged by the Administration unfit for Service), it is, in our Opinion, opening a Door to introduce a large Body of commissioned Pensioners. These Suspicions are strengthened by the Experience we have had, that no Rank has been either above or below Ministerial Resentment, and the Severity of Parliamentary Discipline. And we must with Concern observe, that the Honour of the Nation, and the Fate of this important War, has been intrusted to raw and new-levied Troops, in order (as we apprehend) to keep the others at Home, only for Civil Purposes. Dominus Cancellarius declaravit præsens Parliamentum continuandum esse usque ad et in diem Mercurii, decimum diem instantis Decembris, hora undecima Auroræ, Dominis sic decernentibus. Viscount Falmouth. Ds. Willoughby Par. E. of Ross, Leave to appeal. A Petition of Richard Earl of Ross of the Kingdom of Ireland, was presented, and read; setting forth, That he is advised to appeal to this House, from a Decree of the Exchequer in Ireland, made the 2d of July last; and that, the Pleadings and Proceedings being of great Length, the Petitioner could not get them examined, in order to bring his Appeal sooner;" and praying, "That his Appeal may be now received." E. of Ross against Worsop & al. 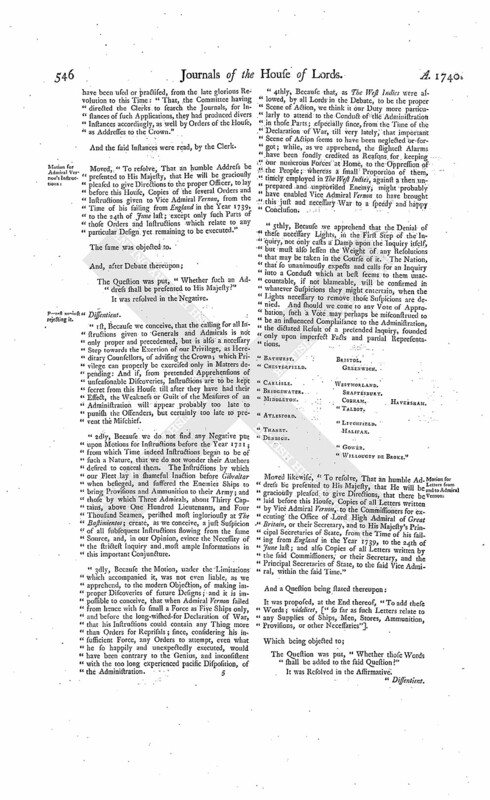 Upon reading the Petition and Appeal of Richard Earl of Ross in the Kingdom of Ireland; complaining of a Decree of the Court of Exchequer in that Kingdom, of the 2d Day of July 1740, made in certain Causes, wherein Elizabeth Worsop, otherwise Wood, Widow, Worsop Bush, and Noah Webb Esquire, by Bill of Revivor and Supplemental Bill, were Plaintiffs, and the Appellant Defendant; and wherein the same Persons, by Original Bill, were Plaintiffs, and the Appellant likewise Defendant; and praying, "That the said Decree may be reversed; and that the said several Bills against him and his late Father Richard late Lord Viscount Ross, deceased, in the said Court of Exchequer, may be dismissed, with Costs:"
It is Ordered, That the said Elizabeth Worsop, Worsop Bush, and Noah Webb, may have a Copy of the said Appeal; and they are hereby required to put in their Answer or respective Answers thereunto, in Writing, on or before Wednesday the 14th Day of January next; and that Service of this Order on the said Respondents Clerk in the said Court of Exchequer be deemed good Service. The House being moved, "That Ralph Carre Gentleman may be permitted to enter into a Recognizance for the Magistrates and Town Council of Glasgow, on account of their Appeal depending in this House; they being in Scotland:"
It is Ordered, That the said Ralph Carre may enter into a Recognizance for the Appellants, as desired. The like Motion and Order, for John Hunt to enter into a Recognizance for Jane Vernon Widow, on account of her Appeal depending in this House; she being in the Country. Dominus Cancellarius declaravit præsens Parliamentum continuandum esse usque ad et in diem Veneris, duodecimum diem instantis Decembris, hora undecima Auroræ, Dominis sic decernentibus. Tetbury Church, to re-build, Petition for a Bill. It is Ordered, That the Consideration of the said Petition be, and is hereby, referred to the Lord Chief Justice of the Court of King's Bench and Mr. Justice Parker; with the usual Directions, according to the Standing Order. Edgworth's Petition to retain his Appeal. 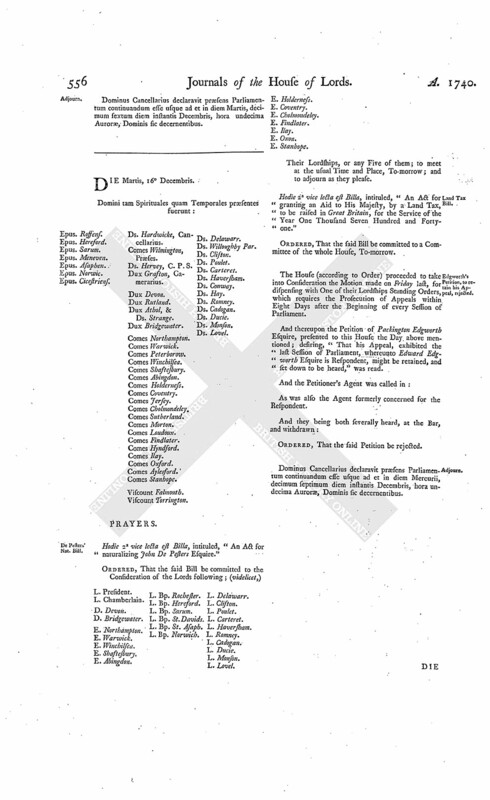 Upon reading the Petition of Packington Edgworth Esquire; setting forth, "That, the last Session of Parliament, he exhibited his Appeal to this House, from certain Orders of the Court of Chancery in Ireland, to which Edward Edgworth Esquire put in his Answer; and that the Petitioner's Agent, through Forgetfulness, has omitted to apply to have the said Appeal set down to be heard within the Time limited by the Standing Order;" and praying, "That the said Standing Order may be so far dispensed with, as that such Day may be appointed for hearing the Cause as to this House shall seem meet:"
A Motion was made, "To dispense with the Standing Order in this Case." It is Ordered, That this House will take the said Motion into Consideration on Tuesday next; and the Lords to be summoned. The House being moved, "That Dennis Delane may be permitted to enter into a Recognizance for Richard Earl of Ross in the Kingdom of Ireland, on account of his Appeal depending in this House; his Lordship being in that Kingdom:"
It is Ordered, That the said Dennis Delane may enter into a Recognizance for the Appellant, as desired. 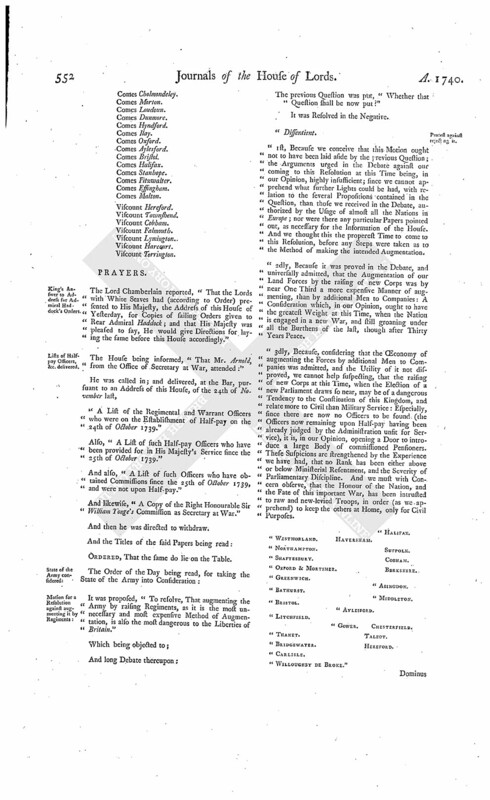 The like Motion and Order, for James Goddard of London, Merchant, to enter into a Recognizance for Betteridge Badham Esquire for the same Reason. Doctor Bland against Archbishop of Armagh & al. It is Ordered, That the further Hearing of the said Cause be adjourned to Monday next. Dominus Cancellarius declaravit præsens Parliamentum continuandum esse usque ad et in diem Lunæ, decimum quintum diem instantis Decembris, hora undecima Auroræ, Dominis sic decernentibus. Neale & Ux. Petition referred to Judges. With a Bill, intituled, "An Act for granting an Aid to His Majesty, by a Land Tax, to be raised in Great Britain, for the Service of the Year One Thousand Seven Hundred and Forty-one;" to which they desire the Concurrence of this House. With a Bill, intituled, "An Act for naturalizing John De Pesters, Esquire;" to which they desire the Concurrence of this House. The House being moved, "That a Day may be appointed, for hearing the Cause wherein Thomas Pringle of Symington Gentleman is Appellant, and Alison Pringle and John McDowall are Respondents:"
It is Ordered, That this House will hear the said Cause, by Counsel, at the Bar, on the First vacant Day for Causes after those already appointed." 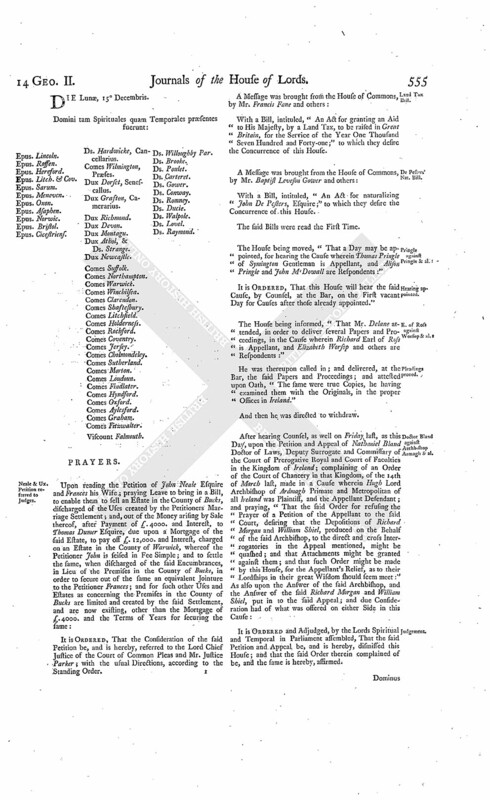 The House being informed, "That Mr. Delane attended, in order to deliver several Papers and Proceedings, in the Cause wherein Richard Earl of Ross is Appellant, and Elizabeth Worsop and others are Respondents:"
He was thereupon called in; and delivered, at the Bar, the said Papers and Proceedings; and attested upon Oath, "The same were true Copies, he having examined them with the Originals, in the proper Offices in Ireland." Doctor Bland against Archbishop Armagh & al. It is Ordered and Adjudged, by the Lords Spiritual and Temporal in Parliament assembled, That the said Petition and Appeal be, and is hereby, dismissed this House; and that the said Order therein complained of be, and the same is hereby, affirmed. Dominus Cancellarius declaravit præsens Parliamentum continuandum esse usque ad et in diem Martis, decimum sextum diem instantis Decembris, hora undecima Auroræ, Dominis sic decernentibus. Hodie 2a vice lecta est Billa, intituled, "An Act for naturalizing John De Pesters Esquire." E. Stanhope. L. Bp. Rochester. L. Bp. Norwich. L. Delawarr. Hodie 2a vice lecta est Billa, intituled, "An Act for granting an Aid to His Majesty, by a Land Tax, to be raised in Great Britain, for the Service of the Year One Thousand Seven Hundred and Fortyone." Edgworth's Petition, to retain his Appeal, rejected. The House (according to Order) proceeded to take into Consideration the Motion made on Friday last, for dispensing with One of their Lordships Standing Orders, which requires the Prosecution of Appeals within Eight Days after the Beginning of every Session of Parliament. And thereupon the Petition of Packington Edgworth Esquire, presented to this House the Day above mentioned; desiring, "That his Appeal, exhibited the last Session of Parliament, whereunto Edward Edgworth Esquire is Respondent, might be retained, and set down to be heard," was read. As was also the Agent formerly concerned for the Respondent. Dominus Cancellarius declaravit præsens Parliamentum continuandum esse usque ad et in diem Mercurii, decimum septimum diem instantis Decembris, hora undecima Auroræ, Dominis sic decernentibus. Upon reading the Petition of Packington Edgworth Esquire; praying, "In regard his Appeal, brought in the last Session of Parliament, is dismissed, not being duly prosecuted; that another, which he has caused to be prepared, may be received, by reason the deferring the same to another Session would be of the utmost Prejudice to him:"
It is Ordered, That the said Appeal be received accordingly. Leeke & al. Petition referred to Judges. It is Ordered, That the Consideration of the said Petition be, and is hereby, referred to the Lord Chief Baron of the Court of Exchequer and Mr. Baron Reynolds; with the usual Directions, according to the Standing Order. Eve Superiori to be naturalized. Accordingly, the Earl of Warwick presented to the House a Bill, intituled, "An Act for naturalizing Eve Superiori, alias Smith." The Earl of Warwick reported from the Lords Committees to whom the Bill, intituled, "An Act for naturalizing John De Pesters," was committed: "That they had considered the said Bill, and examined the Allegations thereof, which they found to be true; and that the Committee had gone through the Bill, and directed him to report the same to the House, without any Amendment." The House (according to Order) was adjourned during Pleasure, and put into a Committee upon the Bill, intituled, "An Act for granting an Aid to His Majesty, by a Land Tax, to be raised in Great Britain, for the Service of the Year One Thousand Seven Hundred and Forty-one." Parkhurst against Smith, in Error. Joseph Smith, upon several Demises of John Dormer Esquire, Defendant. Dominus Cancellarius declaravit præsens Parliamentum continuandum esse usque ad et in diem Jovis, decimum octavum diem instantis Decembris, hora undecima Auroræ, Dominis sic decernentibus. Hodie 3a vice lecta est Billa, intituled, "An Act for granting an Aid to His Majesty, by a Land Tax, to be raised in Great Britain, for the Service of the Year One Thousand Seven Hundred and Forty-one." Hodie 3a vice lecta est Billa, intituled, "An Act for naturalizing John De Pesters Esquire." Upon reading the Petition and Appeal of Packington Edgworth Esquire, and Mary Edgworth Spinster; complaining of Two Orders of the Court of Chancery in Ireland, of the 15th and 18th of December 1739, directing the Trial of certain Issues at Law; and also of an Order made by the same Court, the First of February following, refusing to grant a Motion of the Appellant Packington Edgworth, to discharge the said Two former Orders; and praying, "That the same may be reversed; and that the Issues directed may be taken as found against Edward Edgworth Esquire; and that such other or further Order may be made, for the Appellant's Relief, as to this House shall seem meet:"
It is Ordered, That the said Edward Edgworth Esquire may have a Copy of the said Appeal; and he is hereby required to put in his Answer thereunto, in Writing, on or before Thursday the 22d Day of January next; and that Service of this Order on his Clerk in the said Court of Chancery be deemed good Service. Wright & Ux. for a Bill. It is Ordered, That the Consideration of the said Petition be, and is hereby, referred to Mr. Justice Fortescue Aland and Mr. Baron Abney; with the usual Directions, according to the Standing Order. Sir Francis Skipwith & al. for a Bill. His Majesty, being seated on the Throne, adorned with His Crown and Regal Ornaments, and attended with His Officers of State; the Prince of Wales, in his Robes, sitting in his Place on His Majesty's Right Hand; the Lords being also in their Robes; commanded the Gentleman Usher of the Black Rod to let the Commons know, "It is His Majesty's Pleasure, that they attend Him immediately, in this House." "1. 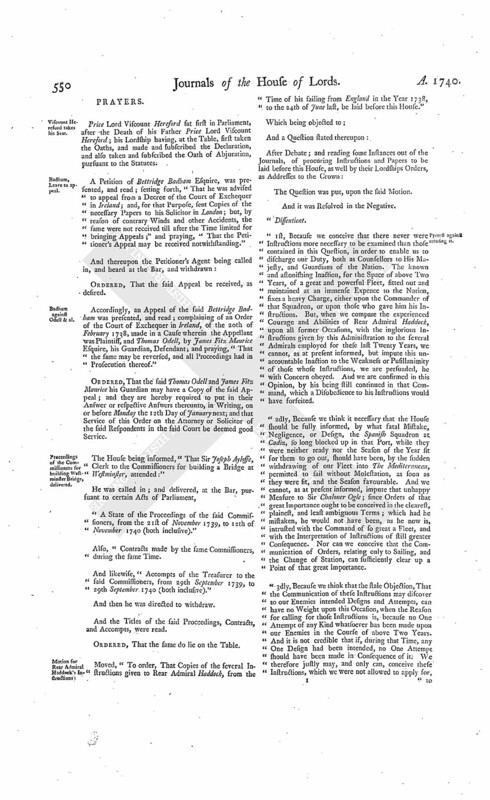 An Act for granting an Aid to His Majesty, by a Land Tax, to be raised in Great Britain, for the Service of the Year One Thousand Seven Hundred and Forty-one." "2. 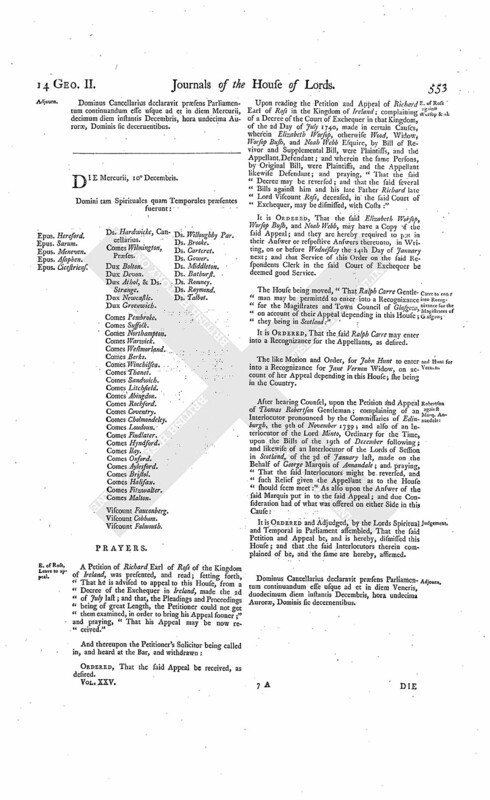 An Act for naturalizing John De Pesters Esquire." Eve Superiori alias Smith took the Oaths appointed, in order to her Naturalization. Hodie 2a vice lecta est Billa, intituled, "An Act for naturalizing Eve Superiori, alias Smith." Their Lordships, or any Five of them; to meet at the usual Time and Place, on Wednesday the 7th Day of January next; and to adjourn as they please. The House being moved, "That Thomas Hartley Gentleman may be permitted to enter into a Recognizance for Packington Edgworth Esquire and Mary Edgworth Spinster, on account of their Appeal depending in this House; they being in Ireland:"
Dominus Cancellarius declaravit præsens Parliamentum continuandum esse usque ad et in diem Mercurii, septimum diem Januarii, jam prox. sequen. hora undecima Auroræ, Dominis sic decernentibus.